﻿ Romans 10:16 But all did not obey the gospel. For Isaiah says, Lord, who has believed our message? But all did not obey the gospel. For Isaiah says, Lord, who has believed our message? However, they did not all heed the good news; for Isaiah says, "LORD, WHO HAS BELIEVED OUR REPORT?" But not everyone has obeyed the gospel, for Isaiah asks, "Lord, who has believed our message?" 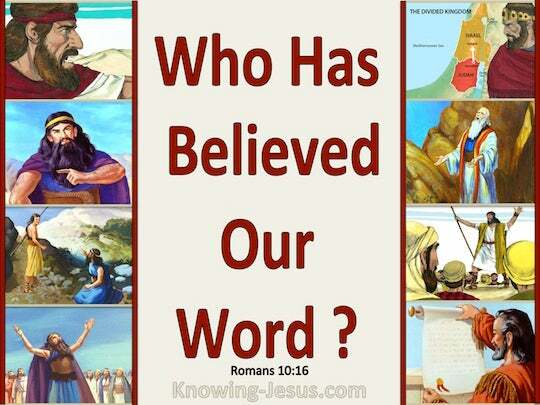 But not all were obedient to the good-news, for Isaiah says, Lord, who has believed our report? But they did not all hearken to the glad tidings. For Isaiah saith, Lord, who hath believed our report? But they have not all heeded the Gospel; for Isaiah says, Lord, who has believed (had faith in) what he has heard from us? But not everyone [of the Israelites] obeyed [that] good news. For Isaiah said [Isa. 53:1], "Lord, who has believed our message?" But they have not all obeyed the gospel; for Isaiah says: Lord, who has believed our report? But they have not all given ear to the good news. For Isaiah says, Lord, who has had faith in our word? But they have not all obeyed the gospel. For Isaiah says, "Lord, who has believed our message?" 'tis true, faith comes by preaching, and preaching is by the divine appointment. But they have not all obeyed the glad tidings. For Esaias says, Lord, who has believed our report? But they have not all heard the gospel. For Isaiah says, Lord, who has believed our report? It is true, they have not all accepted the good news, for Isaiah says, "Lord, who has believed what we have told?" But all have not obeyed the gospel. For Isaiah saith, Lord, who hath believed our report? But not everyone hearkens unto the gospel. For Isaiah says, Lord, who has believed our report? But not all listened to the good news. For Esaias says, Lord, who believed our report? But they have not all obeyed the gospel. For Isaiah says, Lord, who has believed our report? But not all have obeyed the good news, for Isaiah says, "Lord, who has believed our report?" But they have not all obeyed the gospel. For Isaiah says, "Lord, who has believed our report?" But they have not all obeyed to the gospel. For Isaiah saith, "Lord, who shall believe our sayings?" But they have not all given in to the gospel of glad news? No, Isaiah says, Lord, who has believed what they heard from us? And yet they did not all hearken to the good news; for Isaiah said, Lord, who hath believed our message? But they did not all listen to the glad news. For Isaiah says, "Lord, who has believed our report?" But they did not all hearken to the glad tidings. For Isaiah saith, "Lord, who hath believed what he hath heard from us?" 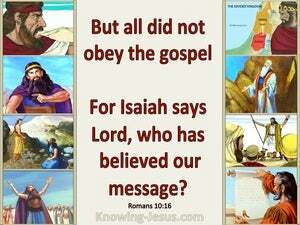 But all did not obey the gospel; for Isaiah says, Lord, who believed our report? But, not all, have become obedient unto the glad tidings; - for, Isaiah, saith - Lord! who believed what we have heard? But they have not all obeyed the gospel. For Isaiah saith, "Lord, who hath believed our report?" But they have not all obeyed the gospel. For Isaiah saith, Lord, who hath believed our report? But, some will say, they have not all hearkened to the Good News. No, for Isaiah asks, "Lord, who has believed the Message they have heard from us?" However, they have not all given heed to the good news, for Isaiah says, "Lord, who has put faith in what we told?" But they didn't all listen to the glad news. For Isaiah says, "Lord, who has believed our report?" But they did not all obey the glad tidings. For Isaiah says, "Lord, who believed our report?" But all have not obeyed the gospel: for Esaias saith, "Lord, who hath believed our report?" 15 And how can they preach unless they are sent? As it is written: How welcome are the feet of those who announce the gospel of good things! 16 But all did not obey the gospel. For Isaiah says, Lord, who has believed our message? 17 So faith comes from what is heard, and what is heard comes through the message about Christ. Who has believed what we have heard? And who has the arm of the Lord been revealed to? What then? If some did not believe, will their unbelief cancel God's faithfulness? Who among you fears the Lord, listening to the voice of His servant? Who [among you] walks in darkness, and has no light? Let him trust in the name of the Lord; let him lean on his God. But you don't believe because you are not My sheep. But this was to fulfill the word of Isaiah the prophet, who said: Lord, who has believed our message? And who has the arm of the Lord been revealed to? Some were persuaded by what he said, but others did not believe. You foolish Galatians! Who has hypnotized you, before whose eyes Jesus Christ was vividly portrayed as crucified? You were running well. Who prevented you from obeying the truth? taking vengeance with flaming fire on those who don't know God and on those who don't obey the gospel of our Lord Jesus. By faith Abraham, when he was called, obeyed and went out to a place he was going to receive as an inheritance; he went out, not knowing where he was going. A stone that causes men to stumble, and a rock that trips them up. They stumble by disobeying the message; they were destined for this.